As the 2018 holiday season kicks off and people across the country gather to reflect on everything they have to be thankful for, there's the traditional core of family, friends and food, of course. In the health IT space we also have plenty of reasons to give thanks: new innovations, encouraging progress on longstanding challenges and more. Let's take a look at some of the most important and encouraging health IT advancements that we're grateful for this week. 1. The future will be data-driven, patient-centric and outside a hospital. The practical futurist Michael Rogers sketched what care delivery might look like in the late 2020s. Among his prediction: booths bearing smart sensors, 8K screens so patients can interact with clinicians, and diagnostic devices, among other cutting-edge tech. 2. Interoperability just had a big moment. 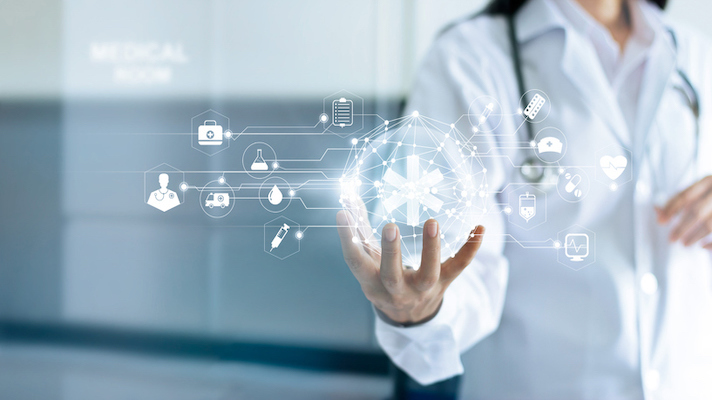 CommonWell just this week implemented Carequality's nationwide connection that means hospitals participating to either can access data from any other member, regardless of which EHRs are used. Micky Tripathi, CEO of Massachusetts eHealth Collaborative and a board member of both CommonWell and The Sequoia Project overseeing Carequality called the development "a signature moment for nationwide interoperability." 3. Innovation is everywhere. So we dove deep back in September and these 3 charts explain where healthcare is headed. While it will take a lot of work to get there, it's encouraging that interoperability, patient experience and telehealth are the Top 3 priorities. Other notables include: patient safety, pop health and precision medicine. 4. Patient engagement and experience are poised for big improvements. For one thing, they'll incorporate applied intelligence and omni-channel messaging. Because we're all patients, after all, it's welcome that the next generation of these technologies are already shaping up to supplement urgent or even retail care for low-acuity situations. 5. We've gone global. Yes, this one is personal. In the fourth calendar quarter of 2018, Healthcare IT News and our sister site MobiHealthNews launched global sites and newsletters to serve readers in AsiaPac, Europe/UK and elsewhere. Why? The growing realization that health IT pros, vendors and hospitals are facing the same existential challenges amid digital transformation. 6. "Scientific wellness" is coming. It's not an entirely new phrase, just one that has yet to gain the heft and ubiquity of precision medicine or personalized health. But that just might change soon. "Over the next 10-15 years there will be a scientific wellness industry in contrast to the disease industry and the market cap will far exceed that of the disease industry," said Leroy Hood, Chief Science Officer at Providence St. Joseph. Pieces in the scientific wellness puzzle will include AI, systems biology, big data analytics, social networks and precision medicine. 7. AI voice assistants are already making an impact in healthcare. In October, 2018 was dubbed the year of the voice tech pilot, in fact. Tech-savvy health systems including Beth Israel Deaconess, Northwell Health and the Commonwealth Care Alliance are already running pilots and proofs of concept. That said, it's also true that some predict 2019 will be the year of bad user experience for voice. Still, we're thankful for that too: Software development is always an iterative process, and setbacks are important to the march of progress. 8. The trend of the health IT industry is "acceleration beyond the EMR." Those are the words of Blain Newton, executive vice president of our sister unit, HIMSS Analytics. He added that change is manifesting "in a few different ways." Here's a hint: blockchain, cloud computing, EHRs and interoperability, patient-generated health data, even supply chain. 9. Regulatory relief is at least starting to roll. The Centers for Medicare and Medicaid Services over the summer introduced what it called historic changes in the form of proposed rulemaking that will, it said, bring big adjustments to payment programs, incentivize telehealth and virtual care and make it more effective for hospitals to share data with each other. We are grateful for the initiative – which is not necessarily to say we're counting on anything turning out exactly the way the proposed rule says it will. But it's also worth noting that the move drew mostly praise from industry trade groups. 10. HIPAA may soon be adapted to the digital age. Much like number 9, this one won't happen quickly. But a Health and Human Services Department request for information relative to overhauling HIPAA moved along to the Office of Management and Budget for review. A small step, indeed, and one that many have people have been saying is needed for years now. Most of all, we at Healthcare IT News are thankful for you, our readers — and we hope that Thanksgiving is a great kickoff to your holiday season.